Mitragyna hirsuta is a plant native to Cambodia, Thailand, and Vietnam. It belongs to the same family as the kratom plant, so they provide similar health benefits. Mitragyna hirsuta is generally known as “krathum khok” in Thailand. In contrast with kratom, M. hirsuta is usually milder and may potentially be more relaxing. What Alkaloids Are Present in Mitragyna Hirsuta? Mitragyna hirsuta started out as a traditional treatment for musculoskeletal aches and pains. Locals would crush the leaves until they are very fine, add it to betel leaves, and then chew on the leaves until all the plant’s juice has been extracted. Low to moderate doses will usually stimulate the mind and boost energy levels. This can be a good way to keep yourself focused. Moderate doses of Mitragyna hirsuta can give stimulating effects that are quite similar to that of the green Malay kratom. Higher doses, on the other hand, can give relaxing effects that are reminiscent of red vein Kratom. Although you may not get the kind of high that can be provided by opioids or certain kratom strains, Mitragyna hirsuta can still be euphoric. Since its effects last longer, it may be the better choice for relieving anxiety and depression. If you’re taking kratom, Mitragyna hirsuta can make kratom effects stronger. By carefully mixing M. hirsuta with your favorite kratom strain, not only will your kratom be more potent, but you will have more kratom to enjoy for a longer period of time. The most prevalent alkaloid in Mitragyna hirsuta is mitraphylline. Other alkaloids include rhynchophylline, isomitraphylline, isorhynchophylline, and hirsutine. Just like kratom’s mitragynine, mitraphylline binds to our brain’s opioid receptors. Thus, we tend to experience effects similar to opioids, albeit to a lesser degree. Steep your preferred dosage in boiling water for about 30 minutes. You can start drinking it when the herb begins to dissolve. Take the solution in small sips to ensure that you don’t get high too fast. Chewing the leaves is one way of taking Mitragyna hirsuta, but it may be better for beginners to make a tea from dried leaves or powder instead. The tea form is usually easier for our systems to digest. Just like kratom trees, Mitragyna hirsuta can be found in various Southeast Asian countries, particularly in the Malay Peninsula. It’s widely used as a traditional medicine in these areas. Though commonly known for its medicinal value, it is also used as an alternative to Cannabis. It’s worth noting that even though M. hirsuta naturally grows in Thailand, it is banned in the country because of its addiction potential. Mitragyna hirsuta has a lot of health benefits that are similar to kratom. Additionally, it can also improve quality of life by boosting the immune system, hastening metabolism, and lowering blood pressure. Many feel sleepy and lethargic after they drink M. hirsuta tea—and this is normal. As long as you take the right dose, you will not have to worry about any ill side effects. M. hirsuta is viewed as relatively mild and is unlikely to cause addiction to the extent that opium does. Because of its therapeutic properties, it is safe to use and legal to consume in most countries. For most enthusiasts, drinking the tea slowly guarantees the best effects. In any case, it’s recommended to consult with your doctor to ensure that you won’t run into any health problems. 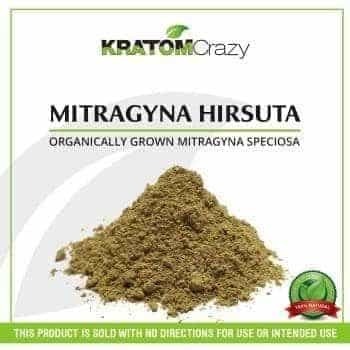 Kratom Crazy sells high-quality Mitragyna hirsuta in 1oz/28g, 4oz/112g, 8oz/224g, and 1lb/448g packs. Although the product doesn’t have mitragynine or 7-hydroxymitragynine (the most prevalent alkaloids in speciosa kratom), it’s currently the top-selling kratom alternative. They also sell the highest quality kratom products at affordable prices. You can buy kratom capsules and kratom powder in various kratom strains (e.g. green vein, white vein, red vein). The effects of Mitragyna hirsuta may be milder than those of kratom, but they usually last longer. It can also be mixed with kratom to make the kratom’s effects more potent. Overall, Mitragyna hirsuta is a reliable kratom alternative for those who are looking for a pain reliever, stimulant, or mood booster.